The alternator is a critical component of your vehicle's operation, as many systems rely on it. The alternator turns energy from the engine's rotating crank shaft into electricity that other parts of your vehicle use. It makes sure the engine and the rest of your vehicle have the power needed to function properly - from air conditioning to radio to headlights. 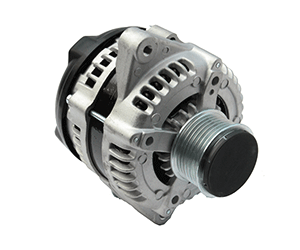 The alternator also keeps the battery fully charged to have the power necessary to start your car. In hybrid vehicles, the alternator helps to ensure the vehicle has enough electricity, so it can operate when the engine is not running. Because the alternator is an integral part of your vehicle's electrical systems, many automotive problems can affect its function. This can sometimes make diagnosis of alternator repair needs, as well as other mechanical issues, more difficult. There is never a convenient time for alternator repair, let alone alternator failure. Your vehicle cannot function without a functioning alternator. If you are noticing any signs of failure, it's crucial to obtain a definitive diagnosis of the problem. At Babcock Auto Care, our ASE-Certified technicians will use up-to-date equipment to diagnose, repair and replace your alternator when needed. When it comes to alternator repairs, we use only quality parts and industry-standard repair methods. We stand by our work, while our alternator repairs are guaranteed by the best warranty in the business.